On the 27th (Thu), you'll have a packed day of sightseeing: discover the deep blue sea with a scuba or snorkeling tour, view the masterpieces at Old Road Gallery, look for all kinds of wild species at Florida Keys Wild Bird Rehabilitation Center, then glide through the air with a parasailing or paragliding tour, and finally sample the tasty concoctions at Islamorada Beer Company Brewery and Tasting Room. To see other places to visit, more things to do, and more tourist information, read our Islamorada day trip planning app . Minneapolis to Islamorada is an approximately 8-hour combination of flight and shuttle. You can also do a combination of flight and bus; or drive. Traveling from Minneapolis to Islamorada, you'll lose 1 hour due to the time zone difference. Plan for much hotter temperatures traveling from Minneapolis in December, with highs in Islamorada at 80°F and lows at 71°F. Finish up your sightseeing early on the 28th (Fri) so you can go by car to Marathon. 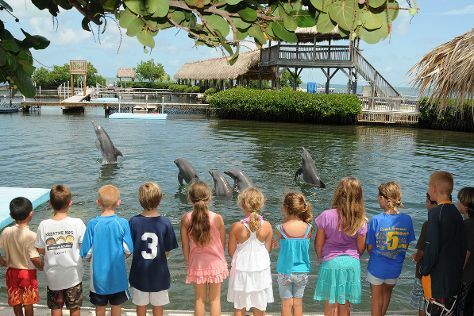 You'll discover tucked-away gems like Dolphin Research Center and Seven Mile Bridge. Get outdoors at Sunset Park Beach and Pigeon Key Foundation. And it doesn't end there: tour the pleasant surroundings at Sombrero Beach, soothe aching muscles at some of the top local wellness centers, identify plant and animal life at Crane Point Museum & Nature Center, and stop by Bayshore Clothing. To see where to stay, photos, traveler tips, and more tourist information, refer to the Marathon online trip itinerary builder . Getting from Islamorada to Marathon by car takes about an hour. Other options: take a bus. Expect a daytime high around 80°F in December, and nighttime lows around 71°F. Finish your sightseeing early on the 31st (Mon) so you can take a bus to Big Pine Key. Big Pine Key is a census-designated place and unincorporated community in Monroe County, Florida, United States, on an island of the same name in the Florida Keys. Start off your visit on the 1st (Tue): immerse yourself in nature at Bahia Honda State Park, then look for gifts at Out of the Blue Gallery, then take in the exciting artwork at Artists in Paradise Gallery, and finally don't miss a visit to Adolphus Busch. To find reviews, other places to visit, maps, and more tourist information, you can read our Big Pine Key trip maker tool . Big Pine Key is just a stone's throw from Marathon. In December, plan for daily highs up to 80°F, and evening lows to 71°F. Wrap up your sightseeing on the 1st (Tue) early enough to take a bus to Key West. You'll explore the less-touristy side of things at Peppers of Key West and Stand-Up Paddleboarding. Your inner history buff will appreciate Key West Lighthouse and Keeper's Quarters Museum and Fort Zachary Taylor. There's still lots to do: relax and rejuvenate at some of the top local wellness centers, browse the eclectic array of goods at Sunset Celebration, take in the architecture and atmosphere at Saint Mary Star of the Sea, and steep yourself in history at Key West Garden Club. For more things to do, where to stay, ratings, and more tourist information, read Key West trip itinerary builder app . Traveling by bus from Big Pine Key to Key West takes an hour. Alternatively, you can drive. In January, daily temperatures in Key West can reach 76°F, while at night they dip to 66°F. Cap off your sightseeing on the 6th (Sun) early enough to travel back home.